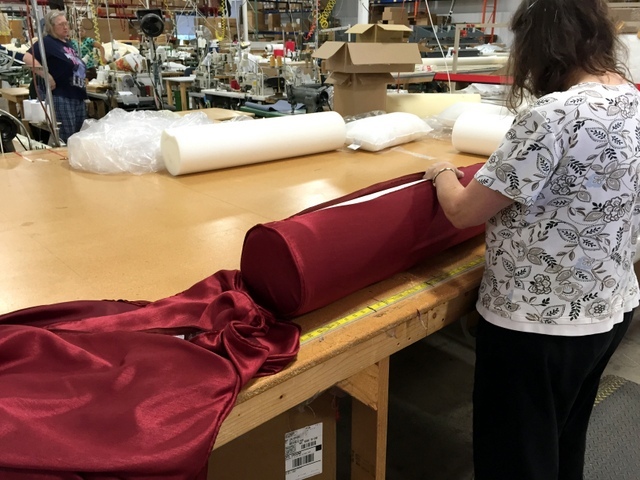 Decorator Industries, located in Abbotsford, WI has been manufacturing custom crafted interior furnishings for the hospitality industry since 1953. Over the last 50 years they have grown into a world-leading manufacturer by focusing on their mission to supply the highest quality experience to both their customers and employees. For their customers, they are a “first cut” producer, meaning they only use the best (first) fabrics produced by top choice vendors. For their employees they offer per-piece profit sharing and are continuously investing in automation to improve employee productivity (and therefore raising per-piece throughput). 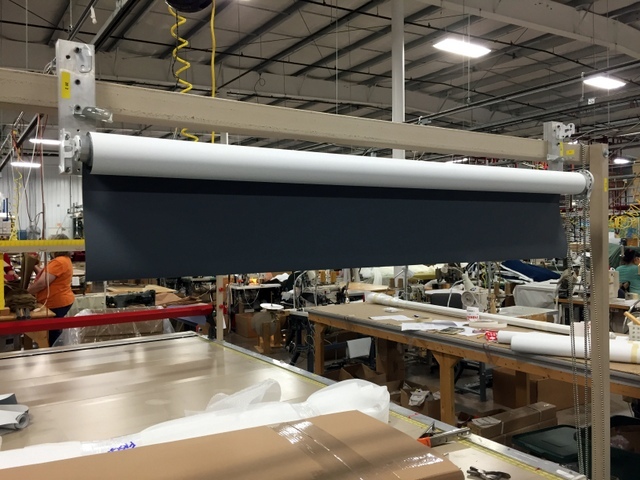 When they began bidding a job to replace all of the window blinds, shades, and black-out curtains for a nation-wide hotel chain in the fall of 2015, they turned to Carlson Design to automate their blind cutting. 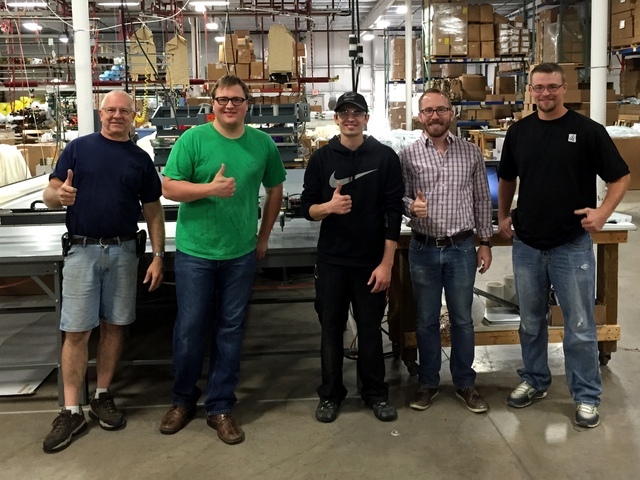 The Decorator Industries Team gives a big “Thumbs Up” with their new “opportunity machine”! 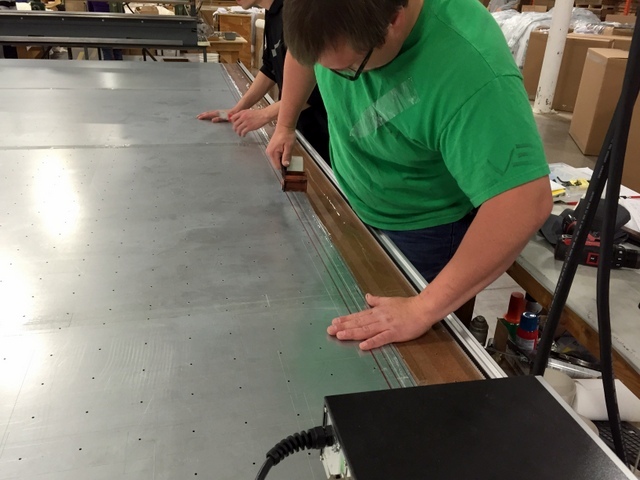 Cutting window treatments by hand is difficult, time consuming, and wasteful. Each cut must be measured and squared for the blind to properly roll and unroll. They currently do not have the right tools to make these cuts, or seal the edge, or maximize their material yield. This means they are throwing away a lot of expensive first-cut material, and producing few finished parts to show for it. 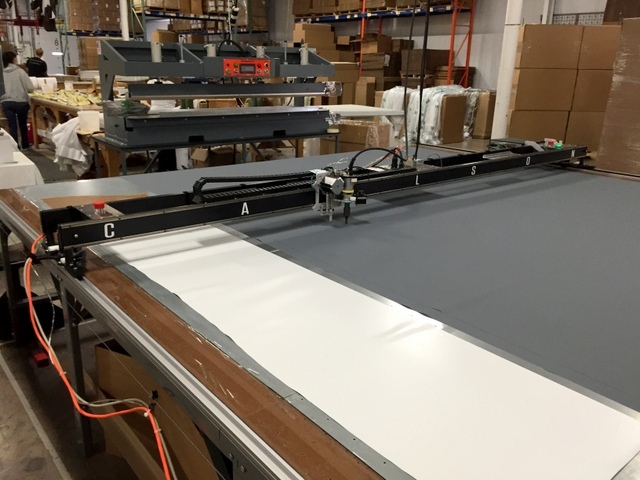 The Carlson Design PTi-132″ Plotter/Cutter with our NEW Ultra-Sonic Cutting Head and Autonesting software. 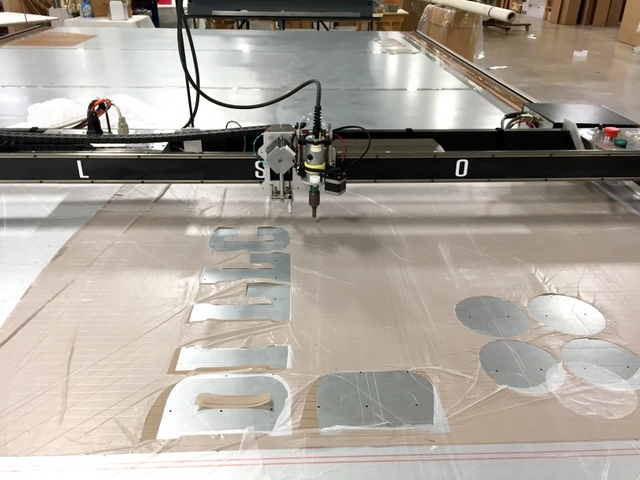 The Carlson Design Ultra-Sonic advantage allows them to solve all of these problems, making fast, straight, sealed-edge cuts, with maximum material yield. 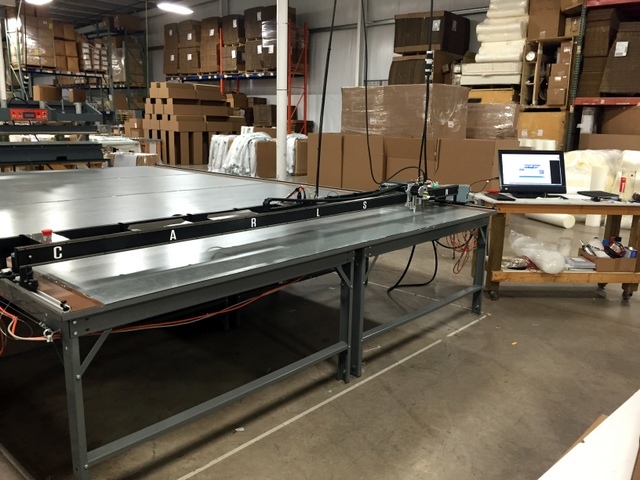 Carlson Design PTi-132″ Plotter/Cutter with Ultra-Sonic Tool Head on a 11’x16′ Phillocraft Vacuum Table. The Carlson Design Ultra-Sonic Cutting Head features two tools — our universal pen holder and the steered ultra-sonic cutting horn. 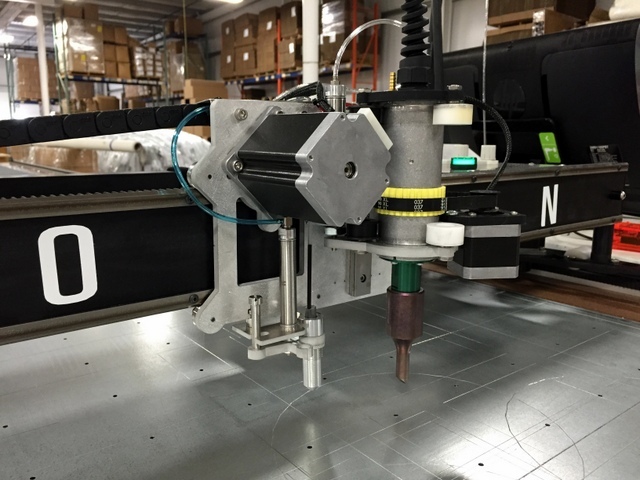 The Ultra-Sonic Cutting Head shares many of it’s components with our standard Pro Production cutting systems, allowing it to also share in the simplicity and supportability of all Carlson Design systems. 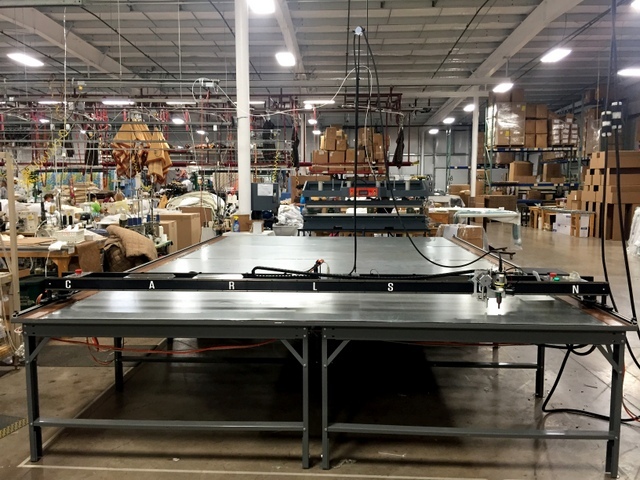 The ingenious on-board mount for JTE-Machine’s ultra-sonic power supply on a Carlson PTi-132″ gantry keeps the system simple and standard. This provides easy operator access to power controls, without adding extra cabling or complexity to our best-in-class production cutting system. FASTER: Average cut time is almost 90% faster. Jobs that took days are now cut in hours. SEALED EDGE: Blinds now have a sealed edge – eliminating freying and improving product life and durability. BETTER QUALITY: Cuts are straighter, more square, and with their sealed edge they “Look much more professional”. MATERIAL SAVINGS: Autonesting improved material yield in some cases by over 100% and improved their competitive pricing by at least $80,000. 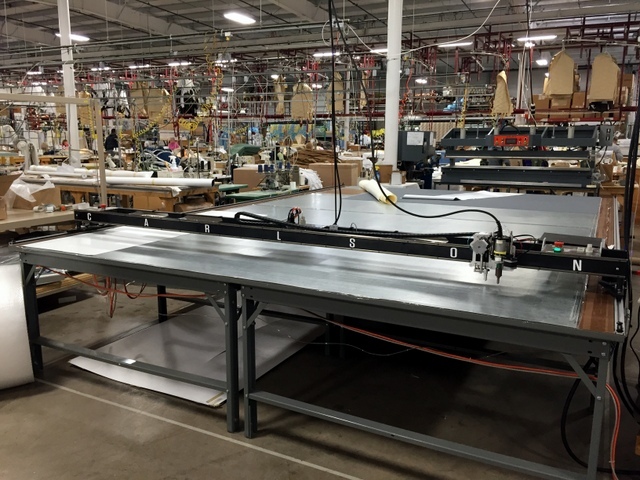 This great looking setup is designed for all-day production cutting. Large quantity orders of repetitive cuts are made easy with the Carlson Design Plotter/Cutter. That “sticky note” shows four different sized blinds ordered in quantities of 155, 12, 126, and 12. 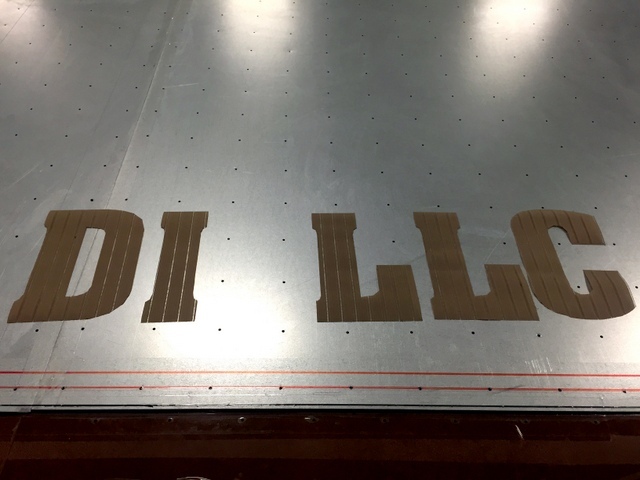 Before their Plotter/Cutter this order would have take over a week to cut — now it won’t even take a full day. 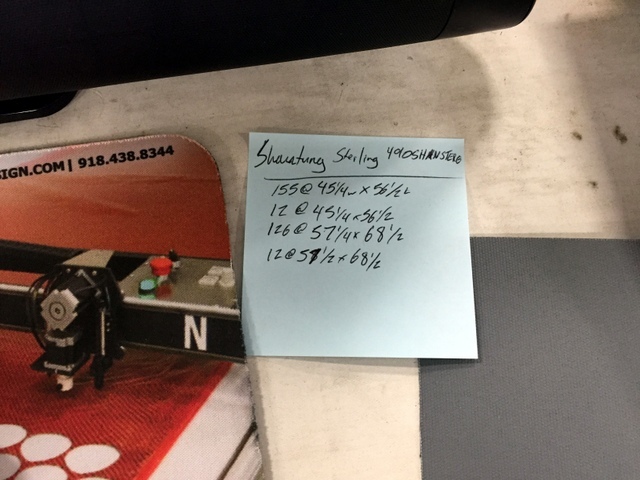 According to Chris, the Plotter/Cutter takes approximately one minute to cut one shade, which is easy to believe after watching the above video. Cutting by hand it can take 8-10 minutes. This means they have saved ~500-600 man hours on the 4000 screens they’ve cut since purchasing their Plotter/Cutter. “The sealed edge and cut quality have really made everything look a lot more professional. No more frey’s, and the cuts are much straighter and squarer”. The Ultra-Sonic cutting tool is the fastest solution for achieving a sealed edge — capable of cutting up to 30 IPS. 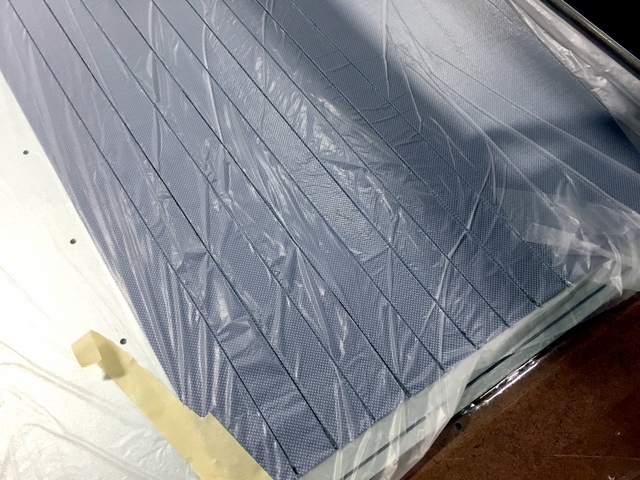 Sealing the edge of a blind makes a big difference in quality — check out the comparison between a sealed and non-sealed edge in the video below. To demonstrate, Chris rolled and finished a blind during the installation. 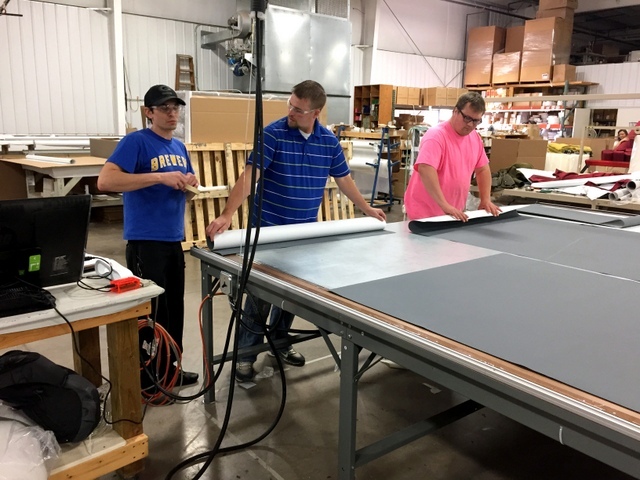 A machine cut blind lays straighter, rolls smoother, and is easier to assemble. The finished edge seen by the customer looks much cleaner. 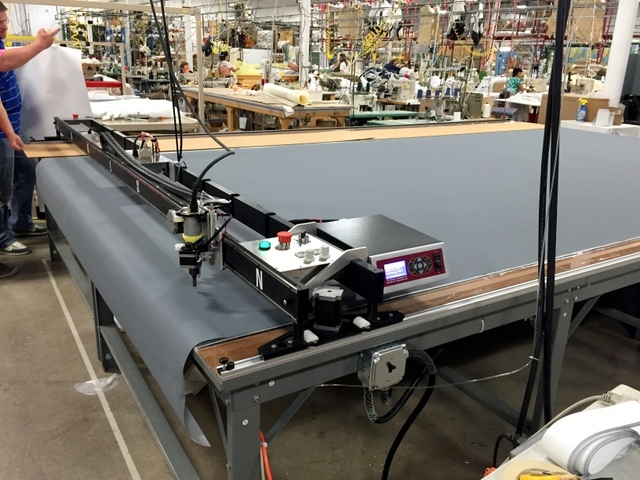 Decorator Industries only cuts “first cut” fabric — which means it’s the best. However, it also means it’s the most expensive. When hand cutting, they would cross cut the roll at the length of each shade — often throwing away as much or more scrap than finished product. 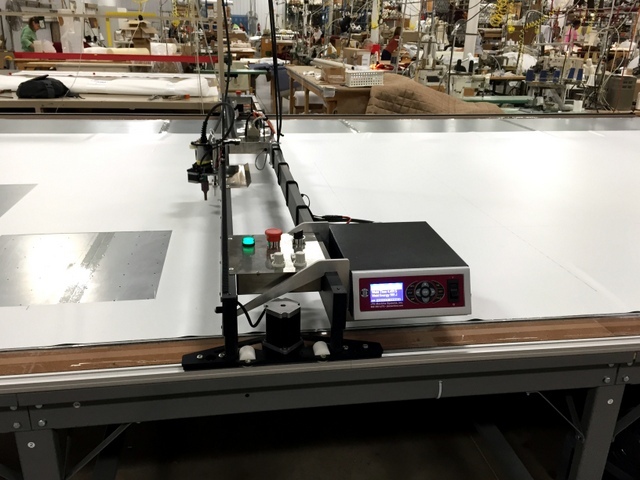 Using our Autonesting software they were able to fit twice as many panels in the same amount of material. If the average blind is two yards long, then at $10/yard they have saved ~$80,000 in material on then 4000 shades they’ve cut to date. That savings is huge when competitively quoting a big job — “and the difference that kept the job from going to [large competitor]”. One of their first jobs consisted of 138 of one size rectangle (45.5×56.5) and 167 of another (57.25×68.5). We ran these patterns through our autonester and quickly determined the needed to cut 69 nested tables. “The great thing about Autonesting is how easy it is to change the quantity.” Running at 15IPS, each table cut in 1:56. 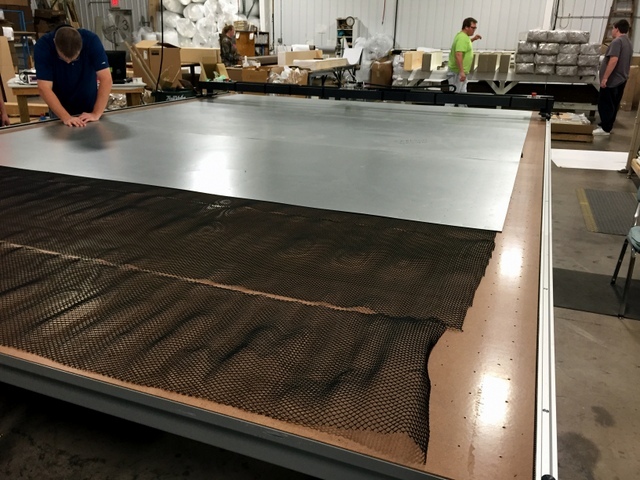 All 305 patterns were cut in half-a-day, with maximum material yield. Nesting patterns allows them to cut edge-to-edge. 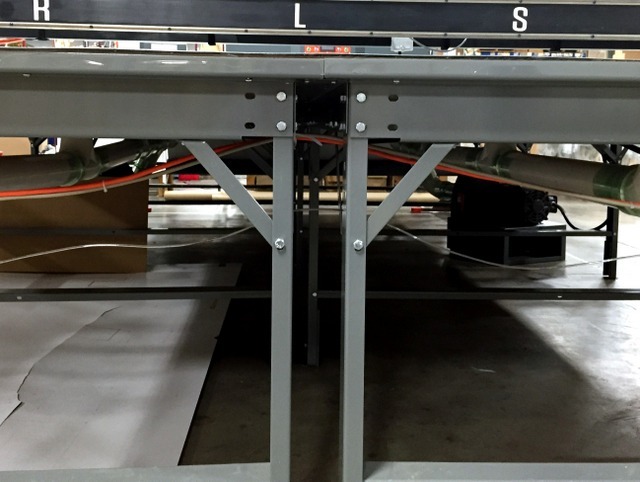 To further speed up cut time, they can “kill” the cut along the factory edge. 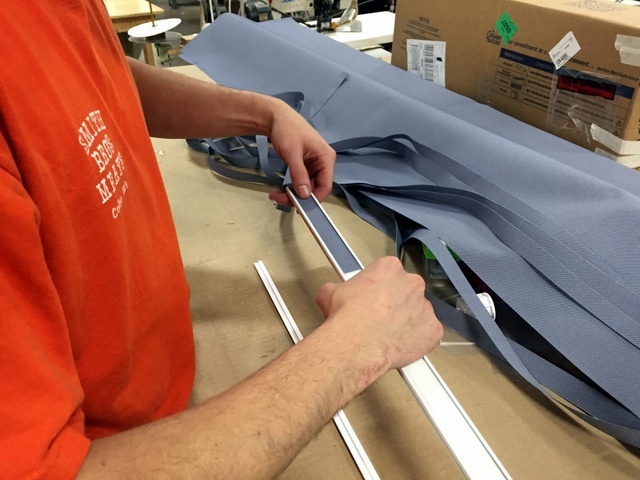 Even simple patterns, like 1.5″ strips, can benefit from nesting — below we utilize and existing piece of “scrap” material to cut trim strips. 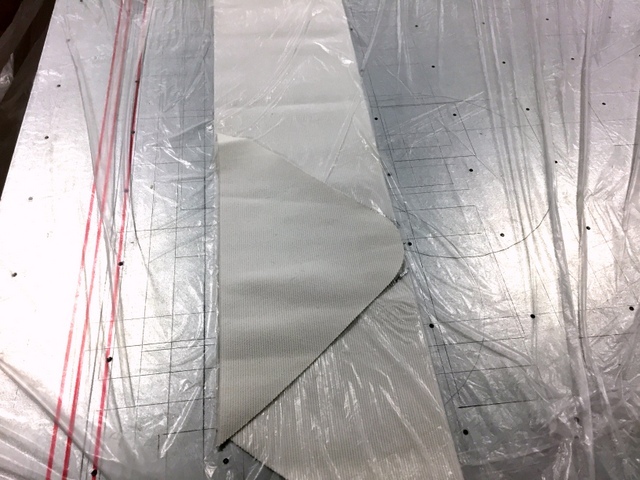 To secure their material during cutting we use a thin plastic sheet to “vacuum bag” their material. These strips are slid into a custom extrusion. The more accurately and consistently these strips are cut, the quicker they can be assembled into a finished product. “One of our only complaints is we want to be able to cut even more on the table.” Let’s do it! The Ultra-Sonic cutting head can plot/cut much more than just rectangles. During the installation we helped them cut elastic triangles, different upholstery materials, and even lettering. A wide variety of materials are used in the hospitality industry – the Ultra-Sonic cutting head is very versatile. It’s also very accurate. To demonstrate accuracy we used our built-in text generator to cut out their company name. Accuracy and a sealed edge! The Ultra-Sonic tool can cut more than rectangles. 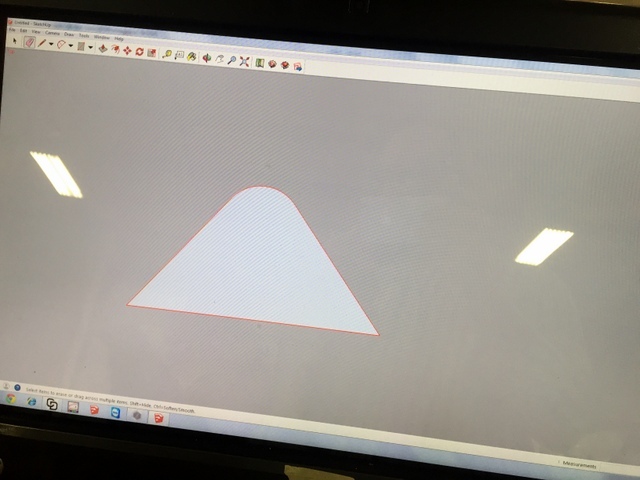 Using our Sketchup plugin they were able to draw a 12″x12″x19″ triangle typically die-cut out of elastic. The elastic benefits from the sealed edge. The material is vacuum bagged during cutting to prevent shift. We’d like to give a big thank you to Chris, Jordan, and the rest of the team at Decorator Industries for helping make this a great installation. We look forward to hearing about the future jobs sold, and the time and material saved. They had their table assembled and leveled before we arrived. This allowed us to finish their entire installation by 1pm on the first day of the install. That allowed for more time to focus on software training and exploring additional opportunity. 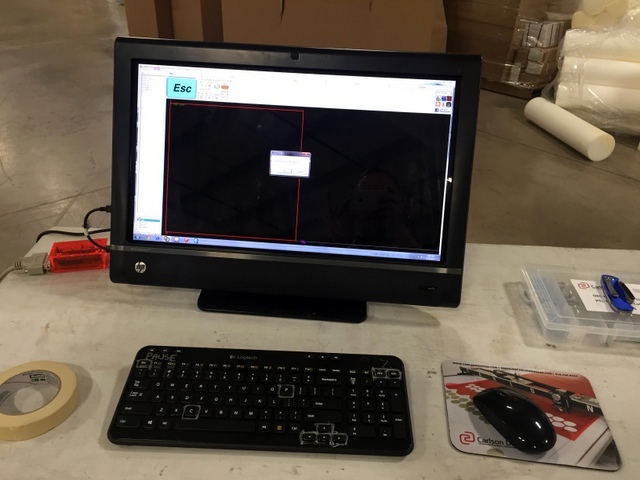 They provided their own All-in-one Windows PC and operator’s workstation. 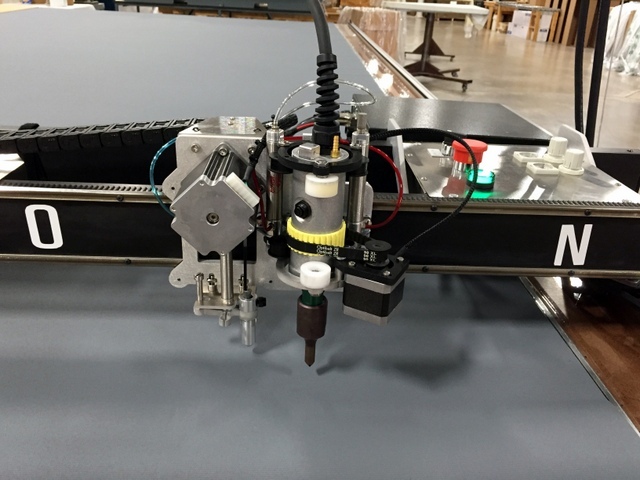 The PTi-132″ Plotter/Cutter with Ultra-Sonic cutting head mounted to a standard Phillocraft steel frame table. 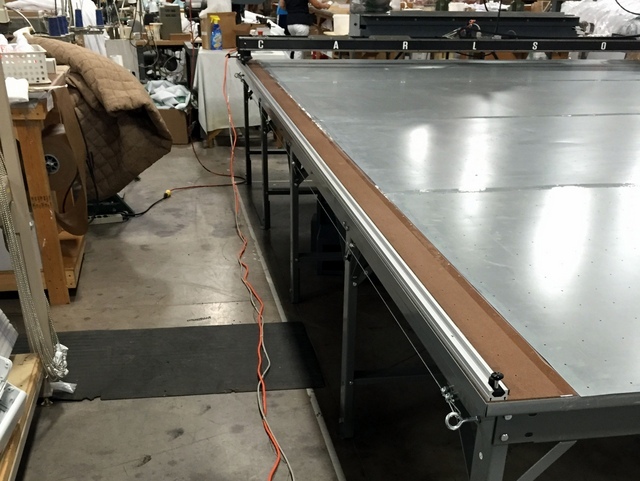 These tables come in endless 4′ long sections, allowing them to easily expand their table later if needed. 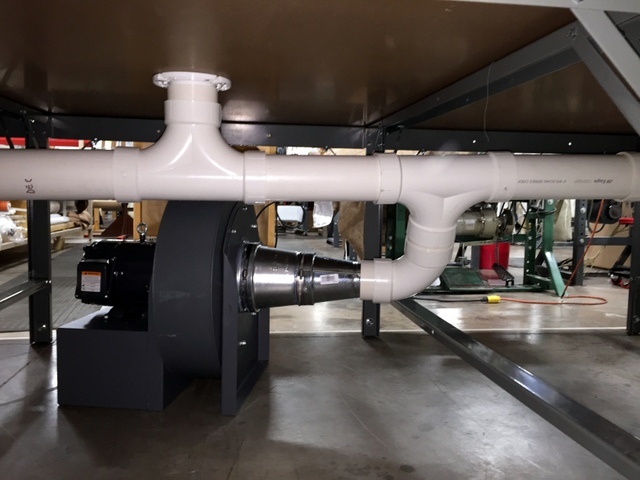 Their table is plumbed with two 5HP radial vacuum blowers. A perforated steel cutting surface is necessary when cutting with the Ultra-Sonic Cutting Head. A woven mesh layer between the table top and cutting surface ensures good vacuum flow. 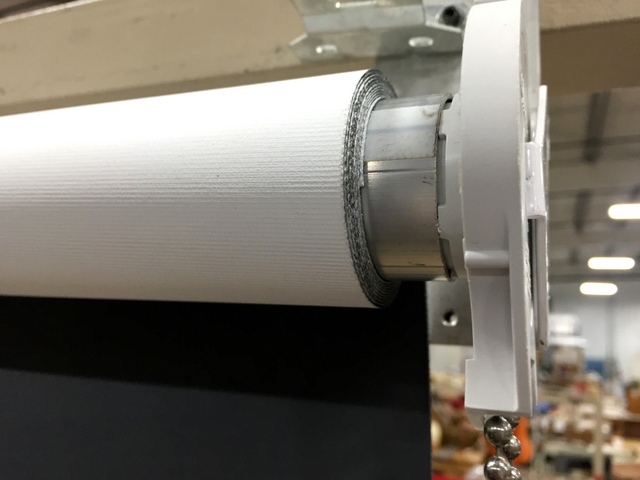 The simplicity of our Ultra-Sonic mount ensures their still only three cables running off the side of the Plotter/Cutter: power, air, and control. They used their Plotter/Cutter pen holder to mark clear alignment lines on the cutting surface. When cutting repetitive patterns it is a good idea to move your start point to extend the life of your cutting surface. Glamour Shot! One last look at a fantastic setup!